NELIOTA uses a dichroic with two fast-frame sCMOS cameras (Andor Zyla 5.5; USB3.0) attached to the prime focus of the telescope to perform simultaneous imaging of the Moon in two channels (R and I-bands), at 30 frames per second. The cut-off of the dichroic is at 730 nm and the R and I-band filters (Astrodon 50-mm diameter, 3-mm thick) are in the Johnson-Cousins photometric system. The cameras are used in 2x2 binning and have a pixel scale of 0.8 arcsec/pixel or 1.5 km (of the lunar surface) per pixel. The orientation of the cameras is such that East is up and North is to the left. Their characteristics are listed in the table below. 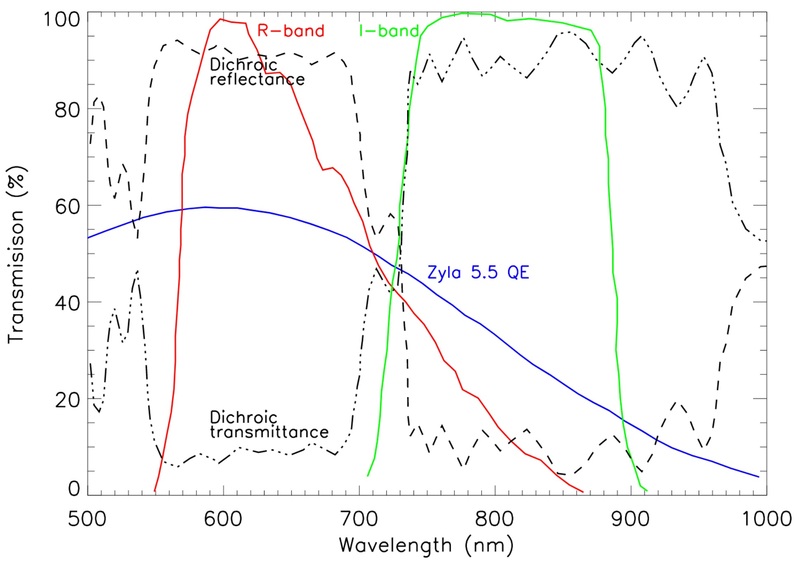 The performance of the Prime Focus Instrument (PFI) optical system (dichroic, filters, cameras) is calculated taking into account the Quantum Efficiency (QE; blue solid line) of the cameras, the transmittance of the R and I filters (red and green solid lines, respectively) and the dichroic (black dashed and dot dashed lines). The dichroic is centered at 730 nm with a > 90% throughput. The figure is from Xilouris et al. (2018). Here is the diagram for the linearity of the sCMOS cameras for the NELIOTA configuration (2x280 MHz, global shutter, low noise & high well capacity). The dark current is essentially zero.